The fact that Cyrus Carpenter Yawkey was a giant in the lumber business is known by anyone with even an inkling of Northern Wisconsin history, but it was his keen leadership skills that put him to the top of the list of area pioneers. One wonders what Wausau, Merrill , Hazelhurst and other area cities would be like if Yawkey hadn’t appeared on the scene. Yawkey was born in Chicago on August 29, 1862. Cyrus attended the Michigan Military Academy at Orchard Lake. He graduated in 1881 and after several years in the hardware business, started his own hardware firm called Yawkey & Corbyn in Saginaw, Michigan in 1894. Cyrus married Alice Richardson, and they had one daughter, Leigh. In 1888 Cyrus sold his interest in Yawkey & Corbyn and joined his uncle William C. Yawkey on a trip to buy timber in Wisconsin. The trip was even more successful than they had hoped for and they purchased large tracts of timber and a promising mill site. A year later, the three men formed the Yawkey & Lee Lumber Company and Cyrus moved to Wisconsin to oversee the construction of a mill on their site, which later became the village of Hazelhurst. In 1893, the Yawkey Lumber Company was incorporated and became one of the largest manufacturers of lumber, lath and shingles. Cyrus went on to become the leader of what was known as the Wausau Group. The Groups’ list of accomplishments under Yawkey’s direction is impressive. They organized and developed the Northwestern Life Insurance Company, Yawkey Lumber Company, Yawkey-Bissell Lumber Company, Wisconsin and Arkansas Lumber Company, Wausau Quartz Company, Globe Mining Company of Birmingham, Alabama, Marathon Paper Mills, Wisconsin Valley Electric Company, Wausau Paper Mills, and Employers Mutual Liability, which later became Wausau Insurance Companies. Yawkey’s interest in all of the large enterprises during the peak 15 years of his life helped make Wausau the industrial center of the Wisconsin Valley. Not only did his active interest in these businesses help them to perfect their organizations, but the confidence the people of means had in Yawkey’s experience and integrity convinced them to assist in providing the needed finances. During World War I, Cyrus Yawkey took his leadership skills to the military where he helped organize a citizens’ military training camp, This later became part of the Wisconsin National Guard. For his efforts, he was promoted to Colonel. Cyrus served as chairman of the Town of Hazelhurst for many years and as chairman of the Marathon County Park board for three years. While on the park board, his land and monetary gifts helped establish Riverside Park, Yawkey Park, the Dells of Eau Claire Park and Marathon Park. In 1894 Cyrus was elected to the Wisconsin State Legislature. 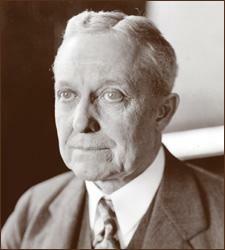 Yawkey died in 1943, and the house he lived in is now the museum of the Marathon County Historical Society. The North Central District of Junior Achievement is proud to honor Cyrus Yawkey as a 2012 Champion of Business.